Well, I'm certain that many of you have been waiting for this one. The second installment in the new Star Wars trilogy has even recieved more anticipation than Howard Shore's next LOTR score, slated to come out later this year. While in honesty, I didn't like that score nearly as well as most film music fans, it was a fine piece of work. But what of the great Williams you say? Well, his latest opus is, to say the least, a fine piece of material. While my attitude towards it is very similar to my attitude towards last years LOTR (I like it, but not as well as most). First of all, I'd say the biggest problem with this new score is the simple fact that it is not drowning in leitmotif. Now I realize that many will scoff at this complaint, but it seems to me that when an idea strays too far from the path, it may not find its way back home. Such is the case here. Even The Phantom Menace was a score that had much leitmotif, and it was therefore easily accesible, just because anyone could sit down, listen, and enjoy. This new score is capable of bringing the listener the same enjoyment, perhaps even more, but the listener is forced to work at it. It didn't strike me down as being "great" upon the first listen, and it probably won't for you either. You really need to get the music into your system and give it a chance. The second problem (and this is much more trivial) is that the new and excellent love theme is not exactly the most original thing to come from Williams' pen, especially not for such a highly regarded series. First of all, the first several notes are borrowed from Dave Grusin's main theme from On Golden Pond, and the rest it more than less sounds like the main theme from Seven Years in Tibet, and overall, it really doesn't seem to sound too "Star War-ish". *But*, since the theme is so epic in scope and grandeur, and so lovely and melodic, one cannot help but hum it constantly anyway. It will stick with you. The next mentioning I must make is that you should be warned that much of what we have in place of leitmotif is often extremely modern and dissonant, but then again, much of it isn't dissonant, and when it's not we have some of the best and most exciting action music that Williams has written in the last several years. The lengthly track 3 proves this fairly early on in the album listen, and for those who are looking for themes from the past to crop up, you should check out track 4 for Yoda's theme, track 10 for "Duel of the Fates, and especially the final track for an oh-so-classic statement of the oh-so-classic "Imperial March". When I first heard that play at the end of the score, only to slide into the new melancholy love theme, I knew that I was hearing the sound of a film event that was going to be talked about for years. There isn't really much else to say about this score other than buy it and give it a chance. I promise that you will be glad eventually, even if you don't care much for it after just the first few listens. If you don't quite get it at first, something will click eventually. Against the rest of the Star Wars series, I'd say that Attack of the Clones is probably one up from being the weakest, just ahead of A New Hope (I really need to review that one soon). In the end, I have to recommend this just like I would recommend any of the other incredible Star Wars scores. Williams certainly has his work cut out for him these days and I'm glad to see that he's still just as up to the task as ever. I'm still looking forward to the movie like I've looked forward to no other in recent memory (unless you consider Final Fantasy from last year recent memory), and I'll be sure to see it as soon as it comes out, which should make up for not seeing episode 1 in the theater at all. Anywho, pick up this CD. 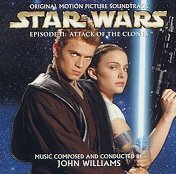 Star Wars: Attack of the Clones is Copyright 2002 Sony Classical. CD produced by John Williams. This review is written by and is the property of Isaac Engelhorn and does not reflect the opinions of Tripod.